I love television shows that make you look up things you don't know and that's what I've been doing throughout the entire season of Victoria. Haven't heard of Victoria? It is Mammoth Screen's docudrama that is currently playing on PBS's Masterpiece Theatre (it played earlier on UK's ITV). And it's as addictive as Downton Abbey. I'm loving it. I love the history and since I don't know a lot about royalty or the Victorian age I often find myself Googling tidbits that are mentioned. I love learning new things so this has added to my enjoyment of the show. I love Jenna Coleman as Queen Victoria and I absolutely want her dresses. I'm happy to see that it has been renewed for a second season. There is a companion book that goes with the show that has photos from scenes and it looks to fill in some of the blanks in my historical knowledge. I don't usually go for companion books, but I'm highly tempted to get this one. 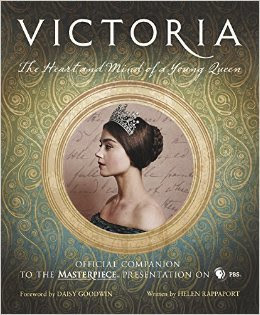 Do you have any recommendations for reading material about Queen Victoria? The season finale airs this Sunday (March 5 at 9/8c). I'm hoping that it comes to Amazon Prime so I can watch it all again. There is so much detail in each episode that they definitely need a second viewing. Looking for more bookish television? Masterpiece will have a one night, 2 hour special on the Bronte sisters. To Walk Invisible: The Bronte Sisters explores how, against all odds, the Brontes were recognized in male-dominated 19th century. I will definitely be watching it. Will you? It airs Sunday, March 26 at 9/8c on PBS.